The white-browed fantail (Rhipidura aureola) belongs to the family of fantails and silktails, the Rhipiduridae. The white-browed fantail species is distributed in India, Pakistan, Nepal, Bangladesh, Sri Lanka, Myanmar, Thailand, Cambodia, Laos, Vietnam and China. These fantail species are insectivorous and have fan-shaped tails. These fantails are polytypic species. The white-browed fantail (Rhipidura aureola) is a small-sized fantail, measuring 17 to 19 cm in length and weighing 10 to 12 grams. The white-browed fantail has blackish brown wings and upperparts. The throat has whitish patches. The crown, eye-band and ear-coverts are black. The broad whitish supercilia meet on the forehead. The wings have whitish spots. The tail is long and fan-shaped. The uppertail is blackish. The edges of the uppertail are whitish. The breast, underparts and undertail are whitish. The bill is short, pointed and black. The irises are dark brown. The legs and feet are long and gray in color. The call of these white-browed fantail species is a low-pitched, melodious whistling sound. These white-browed fantail species are distributed in India, Pakistan, Nepal, Bangladesh, Sri Lanka, Myanmar, Thailand, Cambodia, Laos, Vietnam and China. The white-browed fantail nominate subspecies D. c. caerulescens is distributed in Pakistan, Himalayan foothills in India, Nepal, Bangladesh and central India. The white-browed fantail subspecies R. a. compressirostris is distributed in southern India and Sri Lanka. The subspecies R. a. burmanica is distributed in Myanmar, Thailand, Cambodia, Laos, Vietnam and China. 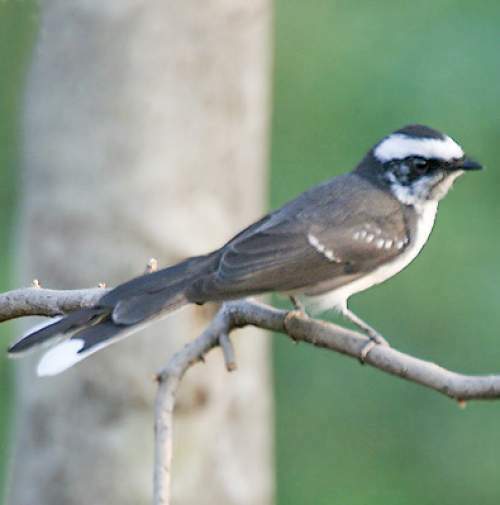 The Important Bird and Biodiversity Areas (IBA) of the white-browed fantail species in Laos are, Xe Kong Plains, Dong Kalo, Attapu Plain and Dong Khanthung. The IBA of these species in Cambodia is Western Siem Pang. 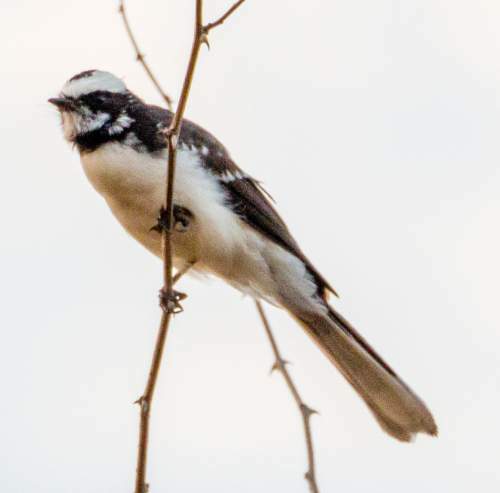 Some of the IBA of the white-browed fantail species in Nepal are, Parsa Wildlife Reserve, Ghodaghodi Lake, Dharan forests, Chitwan National Park, Bardia National Park, Sukla Phanta Wildlife Reserve and Barandabhar forests. These white-browed fantail species have low forest dependence. They normally occur in altitudes from 0 to 1000 meters. The artificial ecosystems and habitats of these species include urban areas and rural gardens. 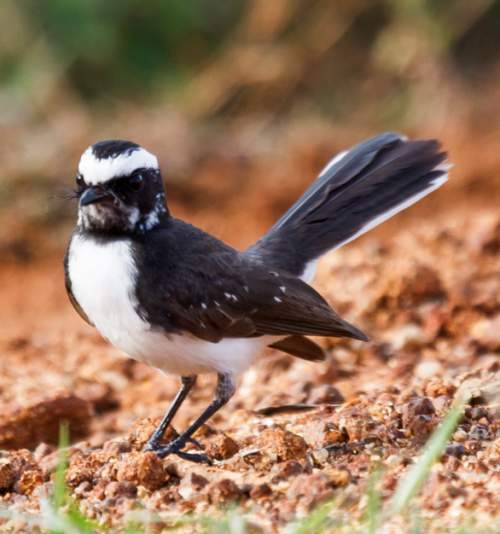 The natural ecosystems and habitats of these fantail species include tropical and subtropical dry forests, dry savanna, tropical and subtropical dry shrublands, open forests and deciduous forests. The diet of these white-browed fantail species consists mainly of flying insects. Flies, crickets, spiders, winged termites and ants are their primary food. They feed from the lower bushes and undergrowth by gleaning insects from the foliage. The breeding season of these white-browed fantail species is from February to August in most of their range in Pakistan, India, Nepal and southeast Asia. The laying season is from January to May in Sri Lanka. These fantail species are monogamous and territorial. The nest is usually built in a fork of a tree. 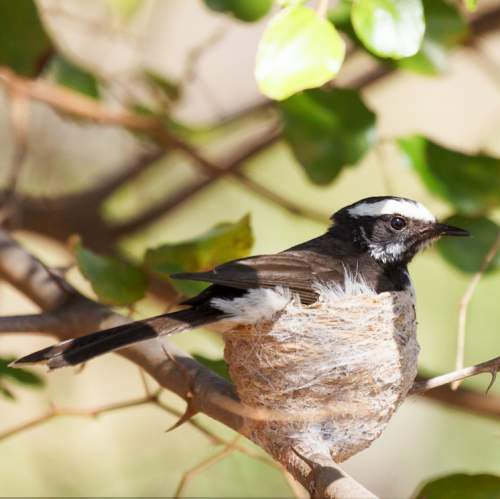 The deep cup-shaped nest is mostly built with twigs, grass and cobwebs. The fantail clutch contains one or two pale sandy colored eggs with reddish blotches on the broader end. Both the parents incubate the eggs. The chicks hatch out after 14 to 16 days and fledge after fifteen days. These white-browed fantail species are non-migratory resident birds. Post breeding, the juvenile fantails may disperse and establish in new locations within the range. Within their range they may make local movements for feeding and breeding. The global population size of the white-browed fantail (Rhipidura aureola) has not been quantified. The overall population trend of the species is considered to be stable. In most of its range, this fantail species is reported to be generally uncommon to fairly common (del Hoyo et al. 2006). The generation length is 4.9 years. Its distribution size is about 8,760,000 sq.km. Habitat alteration and destruction, human intrusions and disturbance and capture for pet-trade are the main threats that are endangering the survival of these fantail species. The white-browed fantail (Rhipidura aureola) does not approach the thresholds for being Vulnerable, either under the range size criterion, or under the population trend criterion or under the population size criterion. The IUCN (International Union for Conservation of Nature) has categorized and evaluated the fantail species and has listed it as of "Least Concern". The CITES (Convention on International Trade in Endangered Species of Wild Fauna and Flora) status is ‘Not Evaluated’ for the white-browed fantail (Rhipidura aureola). Rhipidura aureola compressirostris (Blyth, 1849). Current topic in Birds of India: White-browed fantail - Rhipidura aureola.